The Volunteer State Community College Pioneers baseball team is at the end of its regular season. This weekend the Pioneers will face off against the Roane State Community College Raiders. “It’s game by game. Put our heads down and go after it. Worry about the game in front of us,” said Aaron England, relieving pitcher. The three remaining games are preparation for the 2018 postseason. As of publication, the Pioneers would face Roane State in a play-in game situation. “The pressure of it makes it fun,” said England. The pioneers have an overall record of 23-15. “In a disciplinary way coach has guided us in the right way. Team chemistry has been good comparing to recent years. This season has helped us bond,” said Matt Brown, second baseman. The postseason tournament will be from May 6-11, in Chattanooga, Tennessee. Depending on where the Pioneers finish, it is possible they will play on the first day of the tournament at 3:00 p.m. they would play the 10th seeded team. “When we have our hitting, pitching, and defense all rolling together its a dangerous mix for these guys,” said Logan Maloney, assistant coach. The road to the college world series is going through Chattanooga on the Pioneers first pitstop. “The expectation is that every team in this conference is good. Every week we have to compete and give it our all. I look forward to competing each week, and I love facing the competition we get,” said Jacob Cole, starting pitcher. The 44-game grind will end this weekend at home versus the Raiders, but another road will open up as the postseason will only be eight days away after the series is over. “You have to be positive and wait for the next opportunity,” said Ryan Hunt, head coach. “Well it’s always great to end the season off on a good note with a series win going into the conference tournament. That’d be great to not have to be in the play-in game,” said Cole. “I think we have a good shot. I think we can kinda get it rolling again to stay out of the play-in game, which saves us an arm,” said Maloney. To stay updated with the Pioneers baseball club for the remainder of their season follow them @VSCCPioneersBSB on Twitter for updates and analysis. Marvel’s “Avengers: Infinity War” is projected to be the biggest movie of 2018. In “Avengers: Infinity War”, all the superheroes of the Marvel Cinematic Universe must unite to defeat their biggest threat yet: Thanos, whose mission is to obtain all of the Infinity Stones to destroy half the universe. Before seeing “Avengers: Infinity War,” viewers might want to re-watch all 18 films preceding it. However, because some fans may not have the time to see all 18 films, here is an overview of six of the Marvel Cinematic Universe films that help explain the Infinity Stones and the events leading up to “Avengers: Infinity War”. As the first time the original Avengers banded together, this film already features two of the Infinity Stones. One being the Space Stone, located in the Tesseract, and the Mind Stone, located in Loki’s scepter. The Space Stone allows the user to control space and teleportation while the Mind Stone lets the owners control the minds of others. 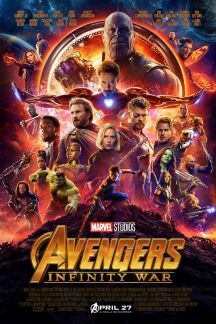 Not only does this film show the intense power of two of the Infinity Stones, but it shows how well all of these heroes work together for the first time. The sequel to “Thor” introduces the Reality Stone, which allows the user to warp reality at its will. At the end of the film it is given to The Collector for safekeeping, who will be later seen in Guardians of the Galaxy. In this comedic superhero film, the Power Stone is introduced in the Orb. The Power Stone gives the wielder immense power that could wipe out all life on a planet. The stone can also increase the power of other stones. This film also explains for the first time what the Infinity Stones are, as explained by The Collector. By the end of the film, the Orb is housed by the intergalactic police known as Nova Corps. This film introduces two new Avengers powered by the Mind Stone: Scarlet Witch and Vision. Vision holds the Mind Stone in his forehead, which seems to be keeping him alive and more powerful than the rest of the Avengers. Scarlet Witch gains the powers of telekinesis through the Mind Stone. By the end of this comedic installment of the “Thor” series, the Space Stone seems to be in the hands of Loki, and Thor’s home of Asgard is destroyed, leaving him and the Asgardians into space. An end credits scene gives a hint that Thanos is already ready to attack Thor and the Hulk, starting his reign of terror.